Home favourite Ding Junhui beat England's Martin Gould to reach the Shanghai Masters quarter-finals, despite losing the first two frames. 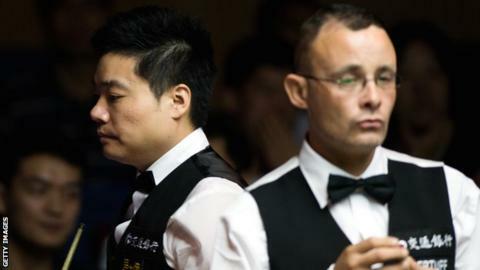 The Chinese world number three, 27, hit breaks of 96, 60 and 67 in successive frames to move 4-2 up and won 5-3. Meanwhile, Alan McManus beat fellow Scot Stephen Maguire 5-1, while Mark Selby won an East Midlands showdown with Michael Holt, triumphing 5-3. Ireland's Fergal O'Brien beat Ding's compatriot Zhao Xintong 5-3. O'Brien and Selby will meet in the quarter-finals. In Thursday's earlier second-round games, Scotland's 2006 world champion Graeme Dott overcame England's 2005 winner Shaun Murphy 5-3 to set up a quarter-final meeting with Ding. England's Stuart Bingham beat Dominic Dale 5-1 as the Welshman could not repeat the success he had in the first round, knocking out Judd Trump. Bingham will meet McManus in the last four. The other quarter-final will be between Michael White, who beat Ryan Day 5-2 in an all-Welsh encounter, and Northern Ireland's in-form Mark Allen who trounced Wales' former world champion Mark Williams 5-1. The tournament has already seen Ronnie O'Sullivan fall to McManus in the first round. The week-long ranking tournament carries a first prize of £85,000.